Mark Samuels is a London-based British writer of weird fiction, the author of a novella and of three collections of short stories (among them the remarkable 'The White Hands' from Tartarus Press and 'Glyphotec & Other Macabre Processes' from PS Publishing). His literary influences include Machen, Lovecraft and (by his own admission) Poe, Borges and Ligotti, but I keep thinking of Samuels as a modern Kafka, toying with the darkest and more horrific aspects of human society and probing the strangest secrets of an alienating world. 'The Man Who Collected Machen and Other Weird Tales,' Samuel's fourth collection was first published in a very limited print run by the Romanian imprint Ex Occidente Press. This slightly expanded edition is from Chomu Press, a new small, but very active English publisher devoted to dark fiction. The volume collects eleven tales ranging from the surrealistic to the overtly horrific, mostly imbued with that sense of gloom and anguish which is a trademark of Samuel's fiction. A fine example of the author's fiction at its best is "Losenef Express", an upsetting but quite fascinating story featuring an American horror writer traveling in East Europe. After committing an absurd murder the man runs away by taking a train ride bound to an unexpected, amazing destination. 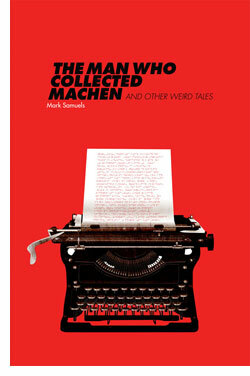 The title story "The Man Who Collected Machen" is the lucid report of an overwhelming obsession shared by a wealthy, unscrupulous collector and by a young man of limited means. In the extremely creepy "A Question of Obeying Orders" a war deserter ends up in a remote village where the dead respond to an irresistible summons, while in the offbeat "Thyxxolqu", yet another of Samuels' disquieting nightmares, a mysterious language spreads all over. "The Black Mould" is a phantasmagoric piece of cosmic horror and "A Contaminated Text" a dark allegory about the power of the written word. Finally "Xapalpa", a traditionally tailored tale with a sinister undercurrent, gives the author the opportunity to exhibit his ability as a straight storyteller as opposed to his usual, oblique narrative style. Samuels is a master craftsman whose pessimism about the universe and the human condition transpires from every sentence, but this is the material of which dark fiction is supposed to be made, isn't it? Monsters can strike terror but real horror is always the result of trip into the dark side of life. Apparently, it is a week for second chances. When 'Reality Hunger: A Manifesto' (Vintage / Random House ; February 8, 2011 ; $15) came around last year, I picked at it for a couple of weeks, trying to read it, trying to get into it, trying to figure out how I felt about it. Back then, I decided that it simply annoyed the living hell out of me, and that while others might find it of interest, my main inclination, should I decide to write about it, would be to make fun of it. I decided that was not in my readers' best interest, and let it pass quietly into the night. But publishers are nothing if not persistent, and although we think of television as the source of "reruns" and "syndication," the publishing industry has been doing a real-world version of that for at least as long as television has. So, when the trade paperback reprint ended up on my living room table, I decided to once again give 'Reality Hunger' a chance. A second chance. This time around, I have to admit that I liked it, enough to read it, and while it occasionally made me think about sending it flying off the back porch, I believe that a fair number of readers may find no small value here. 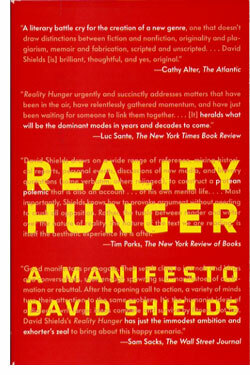 They key to reading 'Reality Hunger: A Manifesto' is to remember that it is a manifesto. It shouts at the reader, and pretty much expects the reader to shout back. If you are averse to this kind of interaction with your reading, but insist on buying the book, and I think it is not a bad idea, then prepare to be infuriated. And read it in a room where there are no breakable objects. Shields' screed is written "a" through "z" in 618 paragraphs. His topics are targets and his targets are topics. He's a man with a 618 darts of varying sizes, and he's aiming at a variety of targets that are on the same wall, but not the same thing. Yes, he does want to both ask and answer that hoary old question, "What is art?" And yes, he is going to talk about James Frey, Oprah Winfrey, Nicholson Baker, "digital culture," art as theft, and not surprisingly, The Bachelor. No matter what level you might think all of these subjects reside on, Shields is leveling the playing field and offering you A Few Good Koans. Go forth and create. 'Reality Hunger' is a book best read in bits. Reading one letter a day is probably the best way to experience the book, though you can easily read more. It might take a while to get the vibe that Shields is going for, but once you're there, it's all pretty refreshing. He has a bit of fun here and there along way, even with the high pith content he aims for and achieves. And if you keep your temper in check, you'll soon realize that he wants to anger the reader, to take you to the much-vaunted "edge." As it happens, the edge is pretty familiar if you've been reading much literature, if you've been thinking about the state of fiction, non-fiction and online writing. It's all out there for you to see, but Shields takes on the hazardous proposition of (in)formalizing a burgeoning new aesthetic with what eventually proves to be the right combination of seriousness and aplomb. One of the virtues of this book, and to be honest, one of the reasons that I was more able to enjoy it this time around, is that is does somewhat function as a field guide to what passes for art in the 21st century. I twigged to this as I spoke with Evan Karp about his work on Litseen. He's got a very interesting combination, when you step back from it. His non-fiction work, Litseen, is a collection of easily-reproduced recordings of artists performing poetry. It's a high-art reality TV show in a format that can be easily duplicated in any locality. And Karp is not trying to establish a brand and create "Litseen: Miami." He's doing good work, a sort of meta-art. 'Reality Hunger' is the sort of book that will make you think differently about what you see and read. It's a parasite, to be sure, but it exists in a symbiotic relationship with its subject. You may or may not want to change how you see the world around you, and 'Reality Hunger' may or may not accomplish that. But set yourself up right, and reading 'Reality Hunger' might just feed an appetite you did not know you had. When we use the word "character" in reference to a novel, it is usually assumed that we're talking about animate beings, generally people. If the setting of a novel is rich enough and plays a crucial part in the plot and characterization, then location, or place can also be referred to as a character. 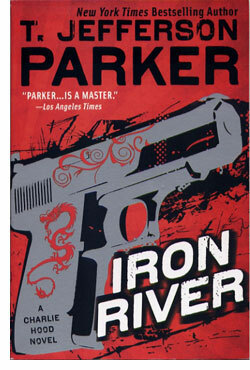 T. Jefferson Parker's 'Iron River,' (New American Library / Penguin Putnam ; Jan 4, 2010 ; $14) which is compelling enough to be worth a second look, offers a new twist on character. In Parker's latest Charlie Hood novel, you'll find the first gun that can truly qualify as a character. Ladies and gentlemen, readers of all stripes, I'd like to introduce you to the Love 32. 'Iron River' is the Jefferson's third novel to feature Charlie Hood, an LA Deputy Sherriff who is working with the ATFE to slow down the flow of guns crossing back and forth over the border between Mexico and the United States. I read it about a month ago, and went back for a second round before I start 'Border Lords.' 'Iron River' is good enough to warrant two readings, with a taut plot and a dark vision of the undeclared war raging at our borders. Parker, who turns an inanimate piece of weaponry into a compelling character, is clearly going to be on the winning side of any conflict he enters. 'Iron River' is a complex machine itself, and it needs to be. Hood and his ATFE team are trying to trace illegal gun shipments when they find themselves in a firefight with an unfortunate outcome, the death of a bystander. The blowback from this will force Hood, his team and ultimately the United States to take a close look at the Border War that spills back and forth between Mexico and the United States. Bradley Jones, the son of Alison Murrieta/Suzanne Jones, one of Hood's past criminal pursuits, is trying to buy guns, and meets Ron Pace, who is trying to sell them. Pace is something of a prodigy, the youngest son of a gun-making family that has gone out of business due to a lawsuit. Now Ron Pace sits around the empty warehouse, thinking, inventing. And thus we are introduced to the most unusual character in this novel, the Love 32. Parker's treatment of this weapon and its creation are brilliant. From the moment Ron Pace first reveals it, from the moment we see it become what it can become, we're actually rooting for it to do its thing — kill, lots of people, quickly and thoroughly and excitingly. It's beautiful and deadly, utterly compelling. 'Iron River' is a novel where readers will actually want the guns to win. Parker does not stop with the Love 32, however. He also introduces readers to Mike Finnegan, who tells lies that are so compelling, they obviously must be untrue in a naturalistic novel. But nonetheless, we want to believe Finnegan's narrative and his story. Charlie Hood is not so sure. But Finnegan's information is helpful even when it is unbelievable. Parker builds a big picture with lots of quickly moving parts in 'Iron River.' It's easy to read but creates a convincing, complex vision of the full-blown undeclared war that is currently tearing apart Mexico. In a very understated — but, counter-intuitively over-the-top manner, it is a very political novel with a strong statement. The Love 32 stands at the center of that statement and at the center of this novel. It defines itself. It is the son of the son of man, and it is born with but one purpose, to kill men. 'Iron River' leaves many characters alive, some undamaged and the reader with a residual thirst for blood, for more books and more insights into our Border War. Parker's novels seem to be a particularly good place to find that insight, to meet the dangerous characters. The weapons will step to the center of the stage. We're always immersed, even when we're not reading a book. Books simply offer us a chance to immerse in a different backdrop, as different people, and when we return to our lives, they may have interrupted us, just a bit. Sometimes you can even get some perspective. You can read a book and come back to your life, and note how each decision leads to another seemingly inevitable decision. Watching characters struggle and scrabble across the surfaces of their lives in literature helps us get beneath the surfaces of our own lives. When those characters are faced with a harsh and powerful landscape, one that requires all their wiles to survive, we find ourselves pitted not just against nature, but our own nature. David Vann's 'Caribou Island' (Harper / HarperCollins ; January 18, 2011 ; 978-0-061-87572-4 ; $25.99) takes us straight into the lives of Gary and Irene, a couple whose 30-year marriage is coming apart as they struggle to build a cabin on a remote Alaskan island. By many measures, they've done well; they still own a house, and they have two adult children who are relatively sane and both employed. But both feel unfulfilled, and the task that should be bringing them together, building that cabin, is tearing them apart. Trees, ice, dirt, rain, a lake, and two people who are feeling deeply disappointed — it's not a prescription for happiness. Except for readers. Vann's prose is deceptively powerful. You slip right into his hypnotizing evocation of men, women and landscape; the characters and places become instantly more real than your own life. There's an economy to his work, a sparse, pared-down feel that makes 'Caribou Island' easy and pleasurable to read even when what is happening is neither. Vann's an expert at trimming words, at making the language flow so naturally, you cannot help but be caught up in his vision. 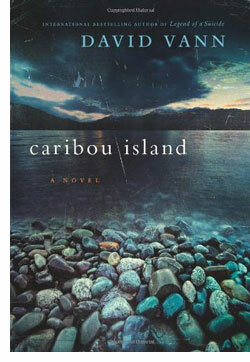 'Caribou Island' is language as a river, inevitable and inescapable once you immerse. What makes the book so pleasurable is that once you're in, you'll meet an unforgettable cast of characters who are remarkably entertaining. Gary and Irene, the older, married couple who form the core of the narrative, are complicated and unreflective. They each experience glimpses into their own motivations, but as readers, we see everything with perfect clarity. Irene understands that Gary is a "champion at regret," but not her own capacity for self-deception. Vann's an expert at examining his characters' thoughts in a psychological context so clearly and compactly described that we as readers can see what they cannot. It makes reading their grim story pleasurable and powerful. Vann's smart insights into character yield lots of very funny humor as well as pathos, and he offers readers a large cast of characters who are fun to watch as they all explore what they can do against the gorgeously-described Alaskan wilderness. His sense of antic tragedy is priceless. The daughter, Rhoda, is living with a dentist named Jim who finds himself attracted to a much younger woman named Monique. She's trouble. The son, Mark, is a genial pothead who lives with another genial pothead, Karen, and they are entertainingly oblivious to the darker undercurrents of unhappiness that surround them. Carl, who came to Alaska with Monique, is dumb enough to get in over his head, but smart enough to realize when it has happened. They're all varied, strikingly real, and come to life with Vann's quick, intelligent sentences. Vann uses this mix of characters to complicate his "bad to worse" plot arc in a manner that is truly compelling. Pretty much everybody in the vicinity of 'Caribou Island' is going to find themselves on the fast track to disaster, but how they mix with one another changes the characters and effectively creates an enjoyable level of tension. And since none of the folks are particularly sharp, not all of them will realize their own shortcomings. If you can't quite figure out that you've failed, if you are a charlatan and don't see yourself as one, then you can be happy; at least compared to those who know themselves all too well, who have set goals clear enough so that their failure is painfully apparent. 'Caribou Island' is an emotionally intense, darkly hilarious novel that uses powerful, precise and compelling prose to examine nature in every form. It is human nature and raw environment, seen with an unflinching eye for detail. This is a novel that hunts as well as haunts the reader. Vann lures us in with lush words, then uses them to corner his characters in front of a mirror. But readers can see themselves in that mirror too. Don't look away. When you're done turning pages in the book, you'll at least be able to see the pages of your life, and with effort, with luck, with love, perhaps change your own story.